Another cheap Chinese designed and made UHF transceiver. This one seems to be a little better in quality and design than the others I've tried. Either they're stepping up their game, or it's because it's a copy of the Yaesu VX-3R. The 24-page manual is the usual haphazard assortment of spelling, punctuation and grammar errors, but you can get the gist easily enough and there hasn't been anything that I haven't been able to understand. The first thing you'll configure after switching it on is the keypad beep, which the manual accurately describes as "uncomfortable". [MODE > Turn knob to 08 - "K Tone" > F/ENTER > Turn knob to Off > F/ENTER > MODE]. The supplied belt clip does not fit. It has some tabs on presumably to stop it rotating, but they've got nothing to mate with on the back of the radio, so it's useless. The knob on the top is the main input device. This is used to scroll through memories and frequencies, adjust the volume with the VOL button and navigate through the settings menu. The knob is locked by pushing it into the radio. The knob doesn't have any 'acceleration' like with an Icom IC-R2, but pressing F/ENTER will make it work in 1MHz steps. As F/ENTER latches, if you hit SCAN with F/ENTER latched, it will scan in 1MHz steps. You may consider this to be either a bug or a feature. When the squelch is open, a overly bright blue LED comes on below the knob. When transmitting, the LED goes red. To change the steps hold the TXPO button. After about 2 seconds it will beep, but there is no indication of which steps size you're using. The FM broadcast band receiver seems quite sensitive, working well on the supplied stubby antenna, and coupled with the powerful speaker this gives a pleasant broadcast band listening experience. One slight niggle is that if the squelch breaks, it will stop the FM receiver and not return after the squelch closes. Also, it's not possible to listen to FM whilst scanning, which would have been nice. FM broadcast is just another band on this radio, unlike other handhelds where you get just an auto-scan FM broadcast radio. The MODE button does not switch modes, it takes you into the settings menu. It should be called something else, and possibly be a secondary function on the key. Scan speed seems to be about 7-10 ch per second. 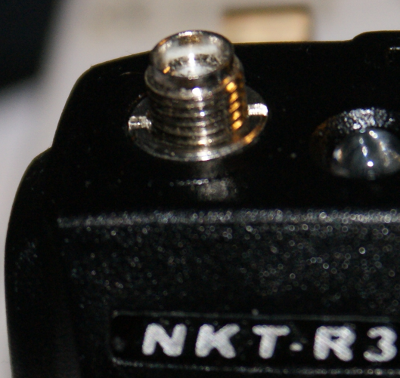 I have used the NKT R3 side by side with an Icom IC-R2 and a Wouxun KG-689, and I have concluded that the KG-689 has slightly poorer receive performance than the other two, but I have struggled to separate the R3 and the IC-R2. It should be noted that I don't have an antenna that I think properly fits each radio, so each was tested with it's supplied antenna. The biggest annoyance is the misleading frequency display when using 6.25kHz steps. This should read 446.06875, but instead reads 446.0685, 446.08125 shows up as 446.081, etc. The SMA socket is unfortunately shallow at 5mm, vs 8.75mm on my Icom IC-R2. This means that the SMA antennae I already have don't quite fit securely. This could potentially be resolved with a Dremel but would be quite messy with the Icom FA-S270C. Keypad backlight doesn't illuminate the writing on the keys, so you can see where they are but not what they do. Low battery alert is intrusive and annoying. You get two short beeps every 15 seconds, and I have found that when scanning it continued to operate for another 90 minutes after the first warning! Receiving DCS, it takes about second for the squelch to open. This is a bit more than an annoyance really, as it makes it very difficult to converse with other DCS users. Its CTCSS implementation does not suffer from this. 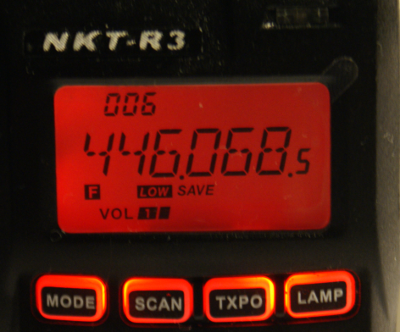 On some frequencies the display doesn't match what my IC-R2 says, beyond mere inaccuracy when in 6.25kHz steps. Some stations come out with buzz and whistle that my IC-R2 don't pick up. ALARM, LAMP and RADIO [switch to VHF FM broadcast band] could have been relegated to secondary function keys. TXPO [transmit power] is already a settings menu entry. This would then leave four primary function keys free, for example, volume up/down. The squelch doesn't seem to have any hystersis, so any signal that flutters on the edge of the squelch will cause lots of clicking and popping. The belt clip may fit on after all, if you remove a U-shaped piece of plastic from around the screw for the clip. Unfortunately, I've lost my clip so I can't confirm this. I've just re-read the manual, and it actually shows this little U-shaped bit of plastic in the "belt chip" installation instructions. Perhaps I should have read the manual a bit more carefully first time round! If you remove the dial, a little W-shaped pingfuckit will fall out and you won't be able to get it back in. It seems to be OK without it though. If you have DCS enabled on a channel, sometimes it will dwell when scanning, but sometimes not.